You don't have to be a fan of the Kentucky Derby or baseball to enjoy a trip to Louisville, the state's largest city. Positioned on the banks of the Ohio River, along the Indiana border, Louisville Louisville, Kentucky's largest city, sits on the Ohio River along the Indiana border. Founded in 1778, the city is one of the oldest cities west of the Appalachian Mountains. Today, it has annual festivals, museums, performing arts centers, sports happenings and plenty of food and drink offerings to appease residents and visitors alike. Whether you're trying to get away ASAP or you're looking to plan ahead based on the cheapest fares, take a look at these forthcoming flights between Raleigh and Louisville, which we pulled from travel site Skyscanner. We've also included popular hotels, restaurants, and attractions in Louisville, to get you started on planning your ideal get-away. Currently, the cheapest flights between Raleigh and Louisville are if you leave on November 28 and return from Kentucky on December 2. Frontier Airlines currently has tickets for $111, roundtrip. There are also deals to be had in December. If you fly out of Raleigh on December 27 and return from Louisville on December 31, United can get you there and back for $290 roundtrip. To plan your stay, here are some of Louisville's top-rated hotels, according to Skyscanner, that we selected based on price, proximity to things to do, and customer satisfaction. If you're looking for an inexpensive place to stay, consider The Brown Hotel. The hotel has a 4.9-star rating on Skyscanner, and rooms are currently available for $129. This hotel is located close to the airport and attractions in the neighborhood include the Louisville Palace and Fourth Street Live. Other attractions include the Muhammed Ali Center. Another 4.9-star option is The 21c Museum Hotel Louisville. Rooms are currently set at $159/night. Attractions near the hotel include the Kentucky Museum of Art and Craft, the Muhammed Ali Center, and the Louisville Slugger Museum. Additional attractions include the Riverfront Plaza Belvedere. If you're looking for an inexpensive place to stay, there's The Seelbach Hilton. The 4.4-star hotel has rooms for $114/night. Set in the heart of Louisville, this hotel is close to Fourth Street Live and the Muhammed Ali Center, as well as the Riverfront Plaza Belvedere and the Louisville Slugger Museum. 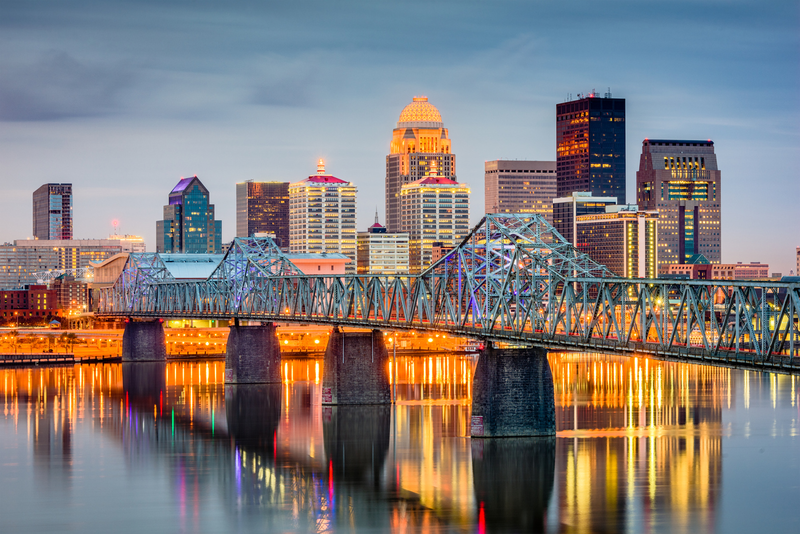 If you're looking to snag a bite at one of Louisville's many quality eateries, here are a few popular culinary destinations from Skyscanner's listings that will help keep you satiated. If you're looking for a local favorite, head to Garage Bar, which has an average of 4.9 stars out of 17 reviews on Skyscanner. "They have great outdoor seating, and a classy, yet dive bar ambiance," wrote visitor Kelly. "The surrounding area, noted as "new Lou" has lots of new hangouts where you can find many activities, restaurants and places to kick back." Another popular dining destination is Jeff Ruby's Steakhouse, with 4.9 stars from 11 reviews. The menu features dry aged USDA prime beef, a fresh raw and sushi bar, as well as some local favorites. "It is a pricier option for dining in Louisville, but a romantic spot for a night out," wrote reviewer Kelly. Also worth considering is El Taco Luchador. "The menu is nicely crafted, and has options for the picky eaters," wrote Kelly. Louisville is also full of sites to visit and explore. Here are some popular attractions to round out your trip, again from Skyscanner's listings. The top-rated visitor attraction in Louisville, according to Skyscanner, is the Kentucky Derby. This event that has been a part of Kentucky society since 1896. The big race, run at Churchill Downs, is the exciting culmination to a two-week festival that includes parades, concerts, and more. "This world famous horse race that is held annually in Louisville is by far the most popular attraction this city has to offer, " wrote Kelly. The Big Four Bridge is another popular destination. "The Big Four Bridge is a pedestrian bridge over the Ohio River, connecting Louisville with Jeffersonville, Indiana, " wrote visitor Steve. "The ramp on either side is about a quarter of a mile, and the bridge itself is half a mile--so if you walked from entry to exit and back again, it's roughly a two mile trek. The bridge is lit up in neon colors from dusk to about 1 a.m."
Finally, spend some time at the Louisville Science Center. "What a fun, hands-on science center in downtown Louisville, " wrote visitor Diane. "You'll see wind and gravity tunnels, wrenches, magnets, bridge building, angles, sound magic and many more."